When JBL announced the Playlist more than a year ago, I was immediately smitten. 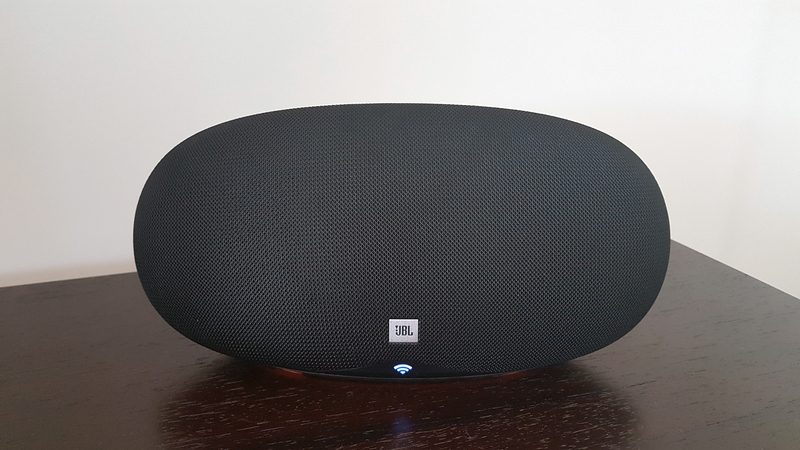 I had heard nothing but good things about JBL's speakers, I had even quickly sampled the Xtreme and Charge 3 at a local store and barely managed to walk away without throwing my money at the salesperson. So the idea of that sound with Chromecast built-in was, to say the least, enticing. Fast forward months of delays where the speaker was nowhere to be found and only available for pre-order in the UK (and maybe some other European countries) and I could have forgotten about the Playlist... if I hadn't set a recurring monthly reminder to check it out. The Playlist eventually launched in the US and across other countries a few months ago and I've been testing it for several weeks. The verdict is positive, as expected. But before I get started, I have to point out one thing: JBL did announce this year the LINK 10, LINK 20, and LINK 300 with Assistant built-in. 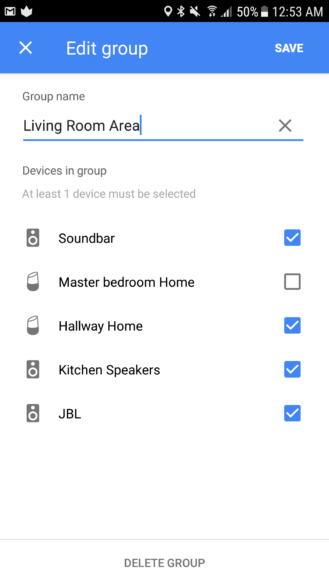 This means they can work like Chromecast speakers, but also have microphones to listen to you so you don't need a Google Home to issue voice commands around the house. However, there's still room for the Playlist for those who don't want a microphone in their rooms, or for those who want better sound for less money. The Playlist costs $149.95 now with its 2x15W speakers, whereas the cheapest LINK 10 is $149.95 and only has 2x8W speakers. Design and build JBL knows how to make good looking speakers with excellent build quality. The Playlist is no exception. 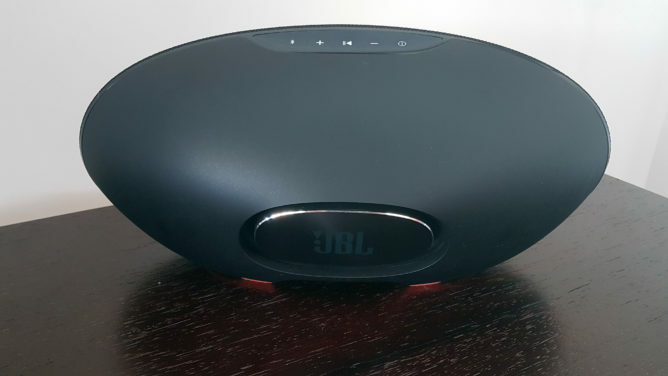 Sound quality As expected from JBL, the Playlist handles all kinds of music gracefully, fills a medium-sized room, and doesn't skimp on bass. Wi-Fi Beside the dual-band support, having your speaker stream wirelessly means you get higher resolution audio, you can listen even if your phone isn't within Bluetooth range, and you don't get interrupted by every notification from your phone. 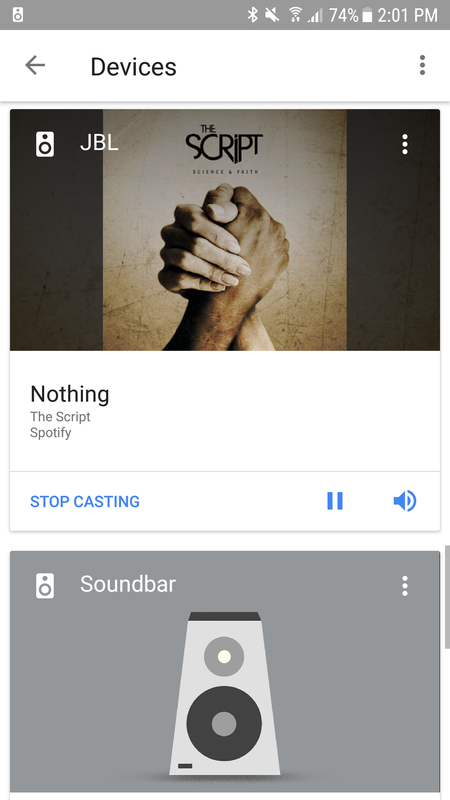 Chromecast built-in You can cast to it from your phone or tablet, use Google Home or Assistant on your phone to issue commands, and add it to a multi-room group. Other options There's Bluetooth, Spotify Connect, and an AUX input, in case you don't want to use Google Home or Assistant. 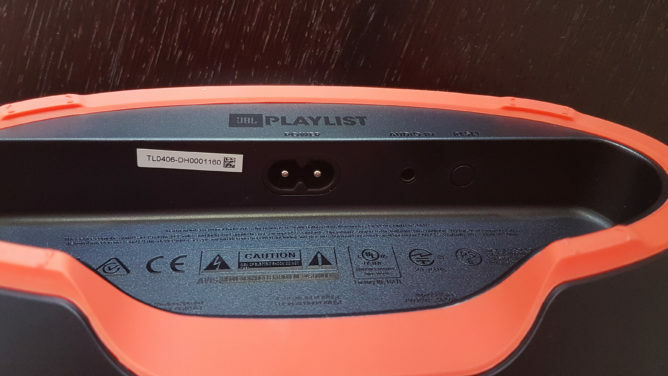 No portability With no on-board battery, the Playlist has to be plugged in to work. It's sad because I would have loved to be able to more easily move it around. Volume The Playlist gets a little too loud for its own good, sometimes. 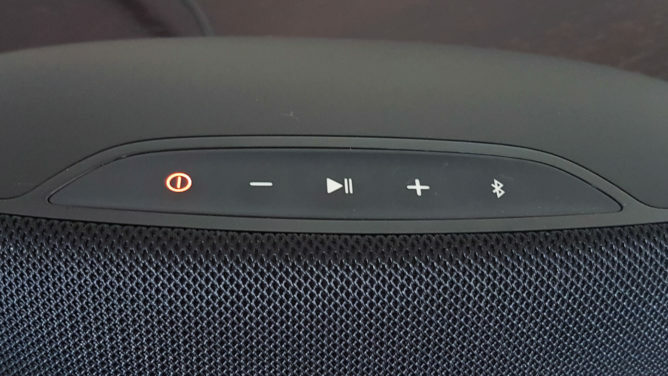 Even from the marketing images, you can tell that the Playlist is a modern-looking speaker. It has a bit of a pill shape from the front, but also the top, and uses a mesh grille to cover the front-facing speakers with a black matte plastic on the rear. The look is relatively subdued in this black color that I'm testing, but there are white and blue color variants that look a lot more striking. 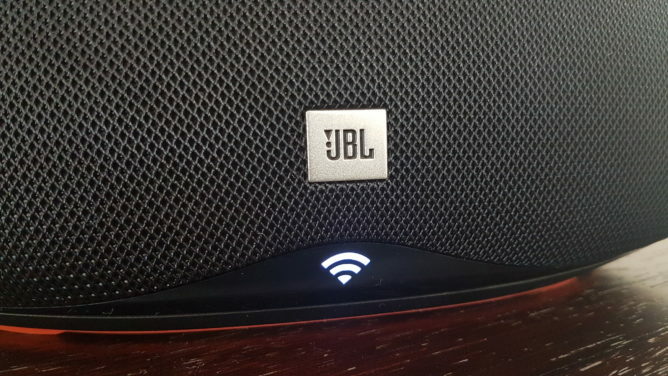 The front doesn't have anything superfluous: beside the grille, all you can see is a small JBL logo and a WiFi signal below it that turns white when the Playlist is connected and streaming. The back slopes in the same pill-shaped form with a passive radiator taking center stage. If music is playing and you put your fingers on it, you can feel the vibrations, which is always cool (even if not very important). The bottom has the only bit of added color on my black unit: an orange rubber frame surrounds the base with 4 feet sticking out of it. The white one has this same orange strip, but the blue one has a blue rubber base too. If you're intimidated by the flashy color, keep in mind that you can barely see it when the speaker is placed upright - check the images above. And to be honest, I think it adds a bit of needed flair. If you let your eyes wonder for a second, you'll also see the power input, AUX plug, and reset button on the bottom. The soft-touch controls aren't immediately visible if you look at the Playlist head-on. They're on the top, but on the rear-sloping part, which keeps them easily reachable but doesn't interfere with the clean design on the front front. There's the power button that stays red in standby mode, volume up and down, play/pause, and a Bluetooth button for initiating pairing. 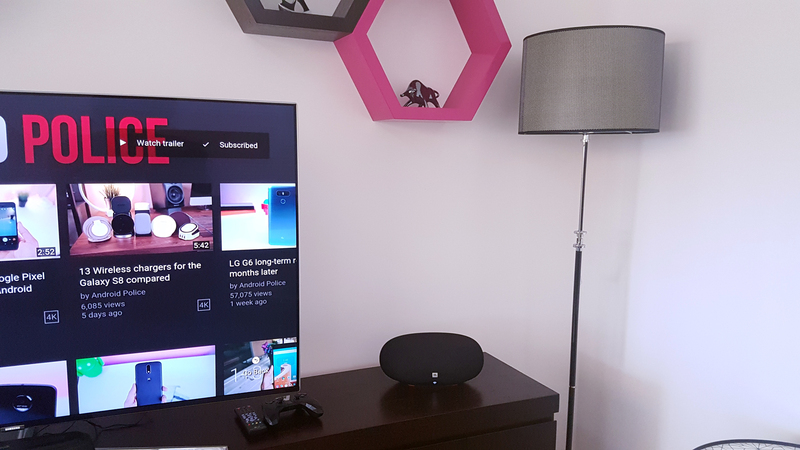 The Playlist is one good-looking speaker and the only thing I found myself missing was a battery to be able to haul it to another room more easily. 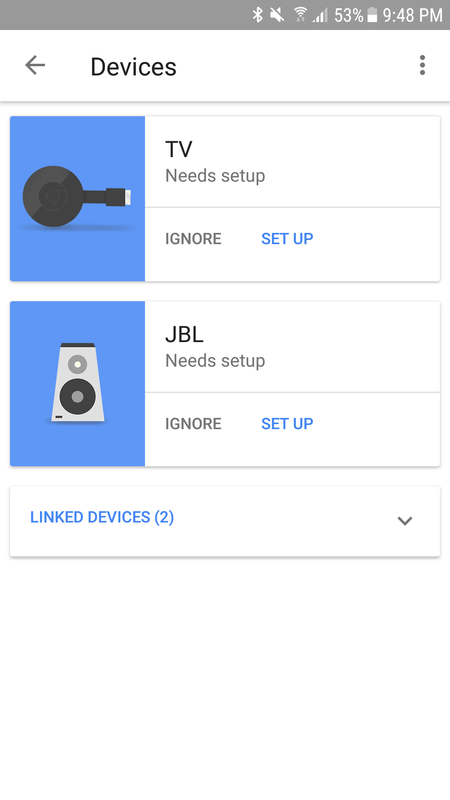 Setting up the JBL Playlist was as simple as connecting it to power and waiting a few seconds for it to show up in my Google Home app ready for setup. 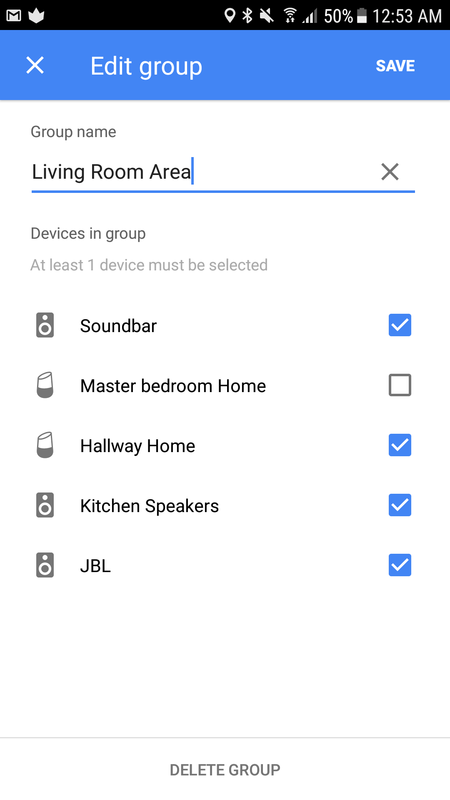 I followed the step-by-step guide to get it introduced to my WiFi network and, after that, the Playlist was inside the Google Home app, ready to be summoned. 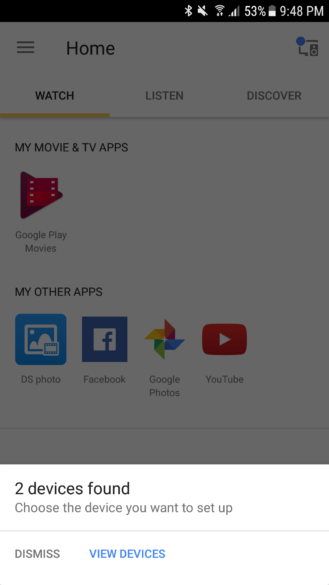 The screenshots below were taken before the Google Home app got its redesign last week. Keep in mind that things will work the same, but will look different with the new app design. 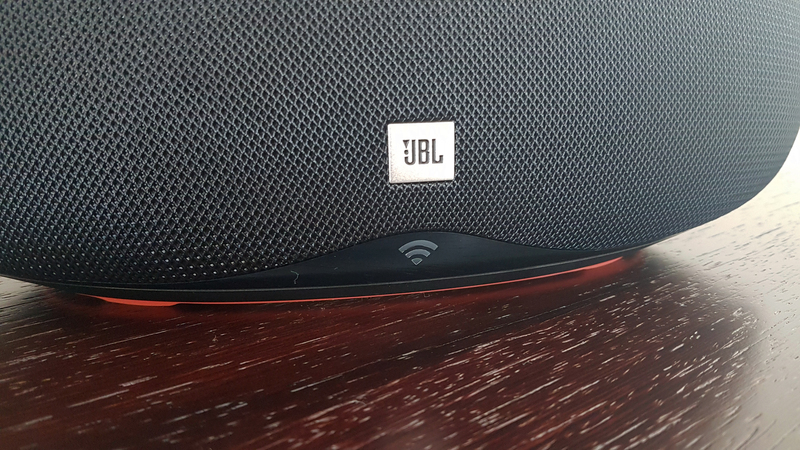 Anecdotally, I simply named it "JBL" so I could say, "OK Google, play Sunrise Avenue on JBL," and it would understand. I'm sure tons of misunderstandings would have ensued if I had called it "Playlist," since usually Google Home looks for your playlists when you say that word. 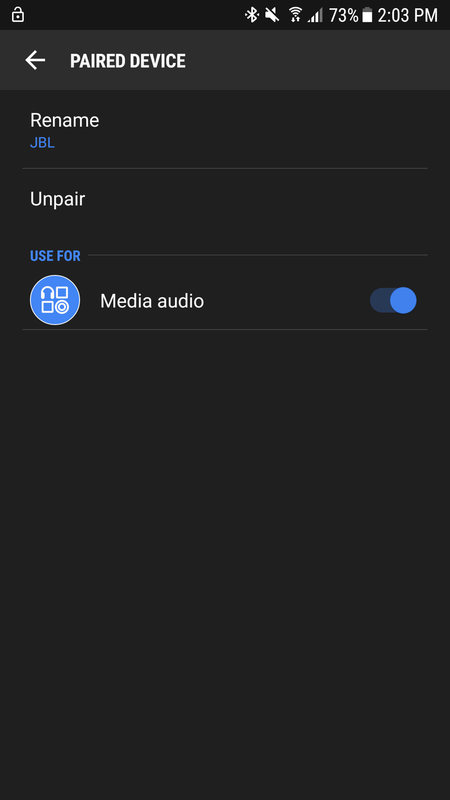 The Chromecast integration also means that I can control playback (even if in limited form) from the app and add the Playlist to a speaker group for multi-room audio. That's probably my second favorite feature, after voice commands: having the hallway, kitchen, and living room play the same tune through 4 different speakers means that the JBL isn't sitting on its own not participating in all the fun. 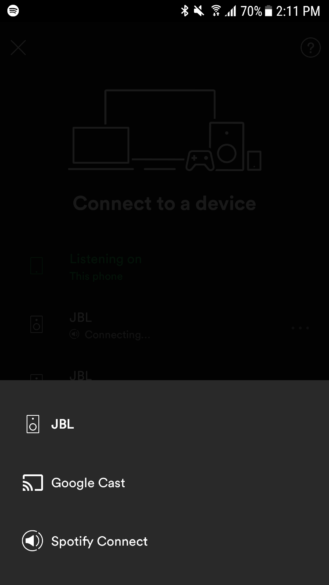 And in the advent that I didn't want to use casting (in apps that don't support it for example), there's AUX input and Bluetooth, along with Spotify Connect integration. 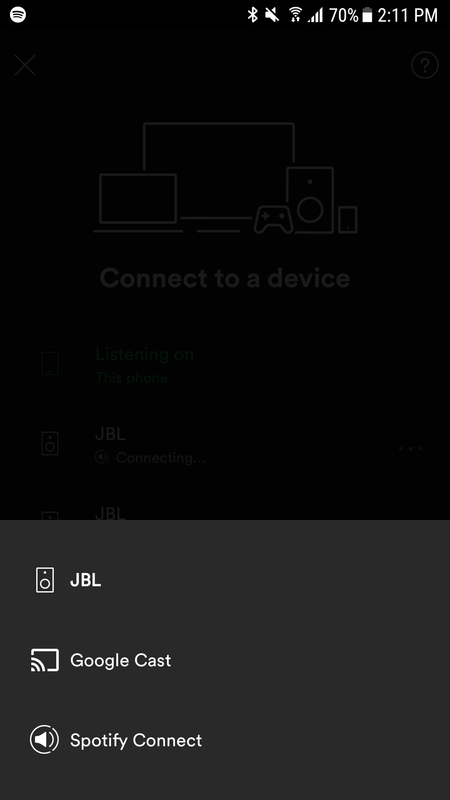 The latter means that inside the Spotify app, you can choose which protocol to listen on: Google Cast or Spotify Connect. I often opted for the former, but the latter can be useful for one case. 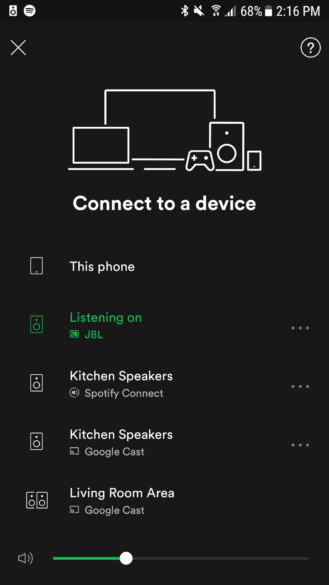 If you trigger it once, the Playlist gets linked to your Spotify account and can thus resume any music playback you had going on by simply pressing the Play button on the top. So if you had Spotify going on your phone, you can pause it there, tap Play on the Playlist, and it will continue there. No fiddling with casting menus, voice commands, or any of that. It's awesome. So here's the meat of the story: does the Playlist sound good? Yes indeed it does. For a speaker of this size, I have to say I was mighty impressed by the volume it can reach. I placed it in our living room (26sqm = 280 sqft, no curtains or carpets yet, but with an open hallway in the middle) and it filled it nicely at around 70% of volume. If you have smaller or more confined spaces, you may find that 50-60% of the volume is enough. I tried to go to the full 100% several times, but I could never leave it at that for too long, for fear of getting a call from our neighbors and for another reason I'll explain below. Over the past few months that I've had the Playlist in our living room, I've gone through the whole gamut of audio possibilities with it. Podcasts? Speech is clear and easy to understand, even if you listen at 1.5x the speed like I do. Instrumental? My violin and piano playlists played well, with every note resonating across the room. 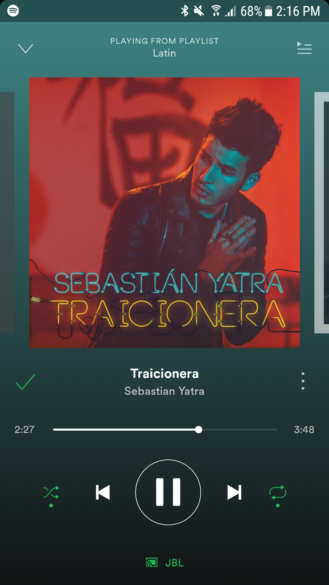 From upbeat latin tunes to romantic Italian songs, country, jazz, rock, dark moody alternative and happy anthemic beats, modern pop with an electropop undertone, I've thrown everything I usually listen to at it, and while the Playlist didn't excel at all, it handled most of them with grace. I found that the Playlist shone with acoustic performances and songs with powerful vocals. Even at 50-60% of the volume, songs like Beautiful mess by Kristian Kostov, L'essenziale by Marco Mengoni, or SOS d'un terrien en détresse by Grégory Lemarchal put the vocals front and center with clarity and depth that feel like they shouldn't be coming from such a small speaker at such a moderate volume. Grégory's high notes in the latter song get, at a point, almost uncomfortably high, yet the speaker doesn't flail and pushes his "haut" like it should around the one-minute mark and again his "ah-oh" around the two-minute mark. Add a little more background to these vocals and the Playlist still delivers this powerful performance without skimping on the lows and highs. Artsvik's voice stays front and center in Fly with me, despite the Playlist dutifully portraying the ethnic notes and throaty background sounds at the beginning of the song and the mish-mash of drums, high notes, and whatever weird concoction happens a bit after the two-minute mark. Another good example is Insomnia by IAMX where the clarity of the tortured vocals doesn't deter from the fast piano and electronic sounds in the background. But don't lead yourself into thinking that the Playlist can't handle music past vocals. It's a cheerful speaker with an almost house-party character that can thump and ring and bounce around from Jai Ho to Despacito to Can't hold us to Hall of fame with gusto. I especially liked the way it played my summer playlist of latin songs, whether it was old-school Santana or modern Luis Fonsi. The same can be said of the reggae/electropop mix that is Cool me down by Margaret, or the contemporary country vibe of Break up in a small town by Sam Hunt. However, the more you delve into alternative rock, rock, and metal with deeper vocals, more intricate drum tracks, and more complex guitar sounds, the more you notice the limits of the Playlist. Some tunes sound more tame than they should be, like War by Sum 41, and others have trouble distinguishing vocals from music like the chorus of White Trash by Kyo. Overall, bass is near excellent at 50-70% of volume, but doesn't carry the same power, proportionally when you step it up to 90-100%, leaving you wanting a little more. Highs, on the other hand, feel more restrained at 50-70% of volume, but go a little out of control at 90-100%. If I wanted to be picky, I'd say the Playlist could have been better off with a little less volume, say if the maximum was around the current 80-85% mark. But again, when you consider the price and size, it's quite amazing that the only real thing I'm complaining about is that it sometimes gets too loud for its own good. After a few months with the Playlist, I understand the appeal of the JBL brand more and I see hear why it's loved by most everyone who has tried its speakers in the last few years. With that said, it's sad that the Playlist didn't get the same publicity or hasn't gained the same recognition as the Flip, Charge, and Xtreme line-up. Sure, it's not battery-powered and it's a streaming speaker first and foremost, but it deserves to be more popular than this. Even Amazon and Best Buy don't carry it, so buyers' exposure to it is quite limited. It looks so tiny from that angle next to a 55" TV, but it's not that small. And the sound... well, the sound is impressive for such a size. It's a very cheerful speaker and its excellent handling of vocals has me in awe since that's the kind of music I enjoy the most. Despite its party-going sound signature, which works well for gatherings, I'd rather make use of it for work-friendly tunes so even though I am keeping it in my living room, it should get relocated to my office once the latter is furnished. Plus, while the volume gets quite loud for bigger spaces, the lack of surround makes it better suited for medium-sized rooms. The clarity should also benefit from that too, even at 50-60% volume. 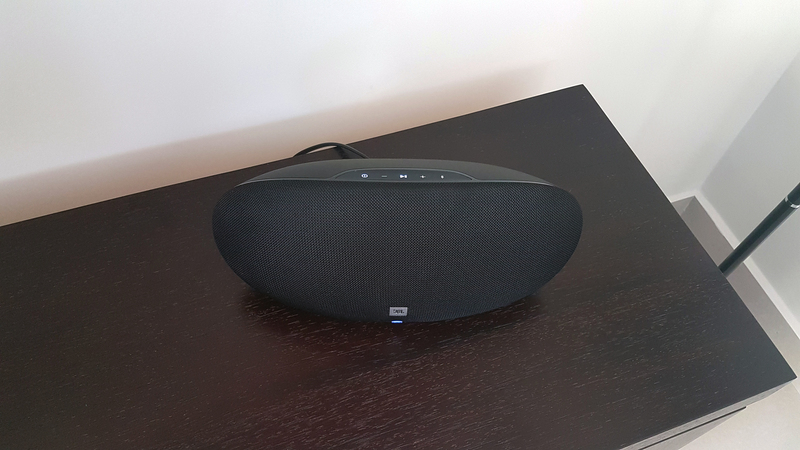 Just like the Polk Audio MagniFi Mini, I find myself having a hard time faulting the Playlist. I would have preferred to see an included battery to move it from one room to another more easily, but that's not a big drawback if you intend on keeping it in one place. I would have also liked to see Assistant built in, so that you can directly issue commands to it. But at the $149.95 price (and even if you add a Home Mini's price on top of that), I think we have a good balance of features and price that's worth considering if you want a good speaker that plays nice alone with your phone or with your existing Chromecast/Google Home setup.